Just a quick note to let you know the latest major release of MDaemon went live right on schedule last night, so it’s now available on our Web site ready for download here. There’s a short PDF walkthrough of the new features and enhancements available on our blog here, or you can view the official product update log here. Current MDaemon license EXPIRED? 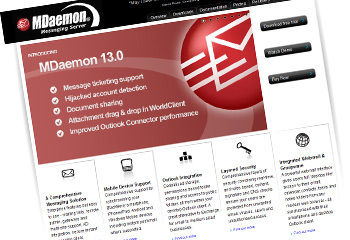 Between the 5th and 30th September 2012, expired MDaemon and Outlook Connector keys can be renewed at half the usual price! If you’re still running an older version of MDaemon and have let the upgrade cover lapse, you may wish to take this opportunity to get up to date…and don’t forget that having a key with active upgrade cover also covers you for free technical support from ourselves.